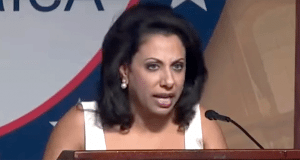 Brigitte Gabriel hosted and spoke at the ACTCON 2016, ACT for America’s National Conference and Legislative Briefing. She addressed the group in common sense terms regarding the efforts to control the threat of radical Islamic terrorism, supporting the logical steps advocated by Donald Trump as a means to defend ourselves and loved ones from the scourge that Hussein Obama and his regime are unleashing upon our nation. That fact that her analogy is based upon common sense and the right to self preservation and self-defense also puts her at odds with the Obama Ebola policy, which was to continue to allow free entry into the United States regardless of the health risk posed to Americans. Perhaps it was conditioning for the present day politically correct madness. Maybe it was just Obama caring more about anyone else other than an American and showcasing his hatred for our country. Gabriel points to the responsibility for stopping the terrorist hordes lies with the Republican Congress. She stresses that meetings with lawmakers, particularly the GOP as they are the only ones who, as minimally as it is, even entertain the concept of being an equal branch of government where Obama is concerned. Withhold the funding to these money making so-called religious organizations doing the importation, and if they are truly concerned with the plight of these people, the organizations can pay to bring them in. They only pretend to care because it’s a financial jackpot and all they have to do is anonymously sellout America to terrorists to get paid. Selling out our nation to terrorists – somebody had to get rich doing it, why not the socially accepted and immune religious charities? UNREAL! Obama Spending $1.5 BILLION A Year On Hot Air!